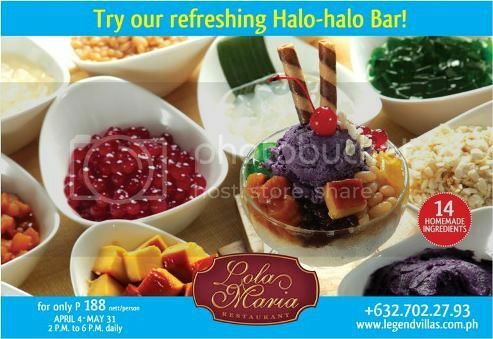 Lola Maria Restaurant’s Refreshing Halo-halo Bar! Summer is here, and what better way to beat the summer heat than to eat halo-halo, an all-time favorite cool treat of Pinoys. One of the yummiest halo-halo can be found at Lola Maria Restaurant at The Legend Villas. Fourteen homemade ingredients made Lola Maria’s halo-halo really special, and you can have this for only Php188.00! This delicious cool refreshment is available from April 4 to May 31, 2pm to 6pm daily. So what are you waiting for? This entry was posted in Halo-halo, Lola Maria Restaurant, The Legend Villas. Bookmark the permalink.